The Natural Way to Ease Morning Sickness! Say goodbye to morning sickness and a queasy tummy. Contains powerful essential oils and plant botanicals proven to relieve nausea and queasy stomach due to pregnancy, labor medications, vitamins and supplements, even post-anesthesia and surgery. 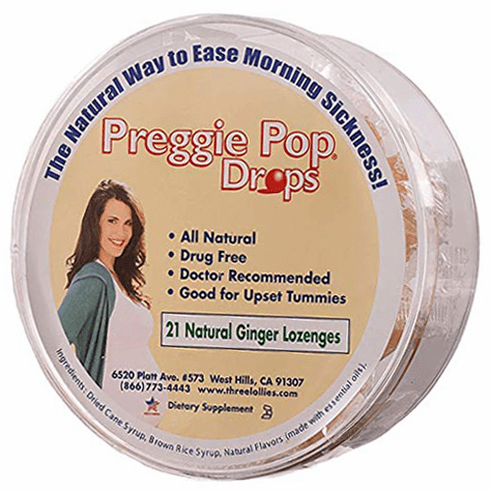 Preggie Pop products are all-natural, drug-free and chemical-free so its 100% safe for mom and baby. Finally an alternative to traditional old saltine crackers or thick cola syrups. Great tasting, fast-acting and highly effective at combating your nausea with no side effects. No artificial flavors or colors. Alleviates dry mouth during labor and provides a quick energy boost. Also makes a safe, more effective alternative to plain ice chips or gum. Each piece is individually wrapped for convenience so they are perfect to take along in your purse, labor bag, pocket, diaper bag, luggage, computer bag, briefcase or to always keep handy in the glove compartment of your car. Goes to work immediately on your upset stomach. Recommended by doctors and healthcare professionals. A container of the most effective flavor of ginger. 21 individually-wrapped lozenges per container. Ingredients: Dried Cane Syrup, Brown Rice Syrup & Natural Flavors (made with essential oils).